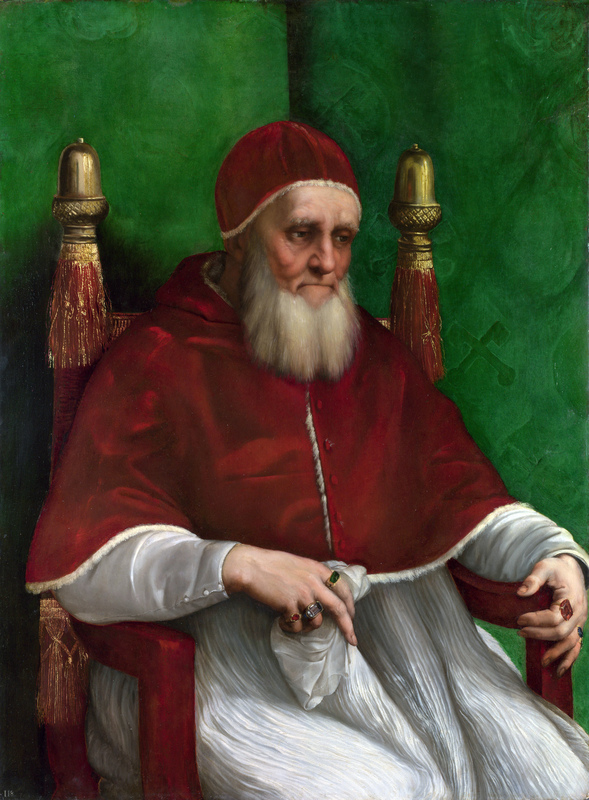 Nicknamed “Il terrible” by his contemporaries and the “Warrior Pope” by historians, Julius II’s early sixteenth-century pontificate marked a notable political and militaristic expansion of the papacy. Born Giuliano della Rovere on December 5, 1443 in Albissola (in the Savona region), he was the nephew of the future Pope Sixtus IV, Francesco della Rovere. His uncle enabled the future Julius to study under the Franciscans in Perugia. When Sixtus became pope in 1471, he named his nephew bishop of Carpentras and soon thereafter cardinal of San Pietro in Vincoli in Rome. Julius would also collect numerous benefices from other bishoprics and abbeys throughout Italy and France. From 1480–82, he served as papal legate to France, beginning a long and complex relationship with the French crown. He was instrumental in the election of Innocent VIII to the papal tiara in 1484, but fell out of favor upon the pope’s death in 1492, when as an aspiring cardinal he was passed over for the Borgia pope, Alexander VI (1492–1503). Julius became an enemy of Alexander, with whom he had been in conflict within the curia prior to the latter’s elevation. He fled to France in 1494 to the court of the French king, Charles III. From there, he encouraged the French conquest of the papal territory of Naples in 1494 and 1495. After this successful military campaign, Julius sought to convoke a council that would depose Alexander for simony, presumably in the hopes of gaining the seat himself. His attempt failed, however, as would his bid for the papacy upon Alexander’s death in 1503. The conclave instead elected the elderly and ill, but diplomatic and reform-minded Pius III—the nephew of Aeneas Sylvius Piccolomini, the former Pius II (1458–64). Pius died just twenty-six days later, and only ten days after being coronated, and this time Julius was able to persuade the cardinals to approve him unanimously in a one-day conclave through recourse to simony of his own. Despite accusing Alexander of simony and being guilty of it himself, the new pope nonetheless sought to prohibit simony in papal elections with a 1505 bull that would be published in 1510 and ratified by the Fifth Lateran Council in 1513. Elected as Roman pontiff on November 1, 1503, Julius sought primarily to reverse the political and militaristic losses under Alexander VI. In his ten-year pontificate, he would expand the Papal States—Italian territories over which the pope ruled as a secular prince—which produced revenue for the papacy, and he also sought to free Italy from foreign powers. He put his own heroism on display by personally leading the 1506 march to free the papal lands of Perugia and Bologna from local rule. His next obstacle toward papal sovereignty over Italy was Venice. In 1509, Julius joined the militaristic League of Cambrai, which was formed the previous year between France, Germany, and Spain, and then later that year moved against Venice, which he had excommunicated for obstinacy toward Rome. Despite this success, however, Julius turned his attention toward France. He made peace with Venice and then attacked the French territory of Ferrara, though he lost and had to restore Ferrara to the French, while relinquishing Bologna to them. As a response to Julius’s offensive, French king Louis XII called a 1511 synod at Tours to renew the Pragmatic Sanction of Bourges. The Pragmatic Sanction had gone into effect during the conciliar controversy when, in 1438, France accepted the Council of Basel’s decrees concerning secular sovereignty over national churches, yet without supporting the council’s deposing of the pope. Louis XIII then aimed to depose Julius by urging a group of dissident cardinals to convoke a council in Pisa. They called the council in September 1511 and assembled there in October. Nonetheless, Julius was undeterred by these measures and formed the Holy League, an alliance with Venice and Spain against the French. England would later join the Holy League and, after a loss to the French in Ravenna in 1512, was aided by the arrival of Swiss soldiers. Afterward, they drove the French from Italy entirely. These various efforts fortified the existing Papal States and added to them the territories of Parma, Reggio-Emilia, and Piacenza. Despite these relative political and military gains, Julius still had to deal with the council at Pisa. In order to keep Maximillian, the Holy Roman Emperor, from supporting Pisa, the pope called an alternative council in Rome for 1512—the Fifth Lateran Council. Thought Lateran V would continue until 1517 under Leo X and address issues ranging from the immortality of the soul to the Pragmatic Sanction to war against the Turk, the five sessions under Julius’s leadership dealt strictly with the so-called conciliabalum, or “pseudo-council,” at Pisa. In the process, the council confirmed the 1460 papal decree, Execrabilis, which prohibited appealing the decision of a pope to a future council. It also ratified the pope’s earlier decree against simony, pertaining especially to papal elections. In addition to these spheres, Julius became known as a patron of the arts like many of his fellow Renaissance-era popes. He famously commissioned the rebuilding of St. Peter’s Basilica in Rome by Bramante, a noted Renaissance architect. To subsidize the project, the pope commissioned the sale of indulgences in 1507, a decree that Leo X would renew and in so doing initiate the indulgence controversy of 1517, thereby precipitating the outbreak of the Reformation. Julius charged Michelangelo with painting the famous ceiling frescoes of the Sistine Chapel, as well as the pope’s own tombstone, and Raphael with decorating the stanzas in the Vatican Palace. Despite these projects, Julius’s relative austerity, not to mention his fiscally beneficial gains across Italy, left the papal treasury with an unforeseen surplus when he succumbed to fever on February 21, 1513. He was buried in the titular church of his cardinalate, San Pietro in Vincoli.